It is said that about 73% of our body weight is made up of water, so someone weighing 60 kgs contains roughly 44 litres of water, of which about 5 litres is blood. 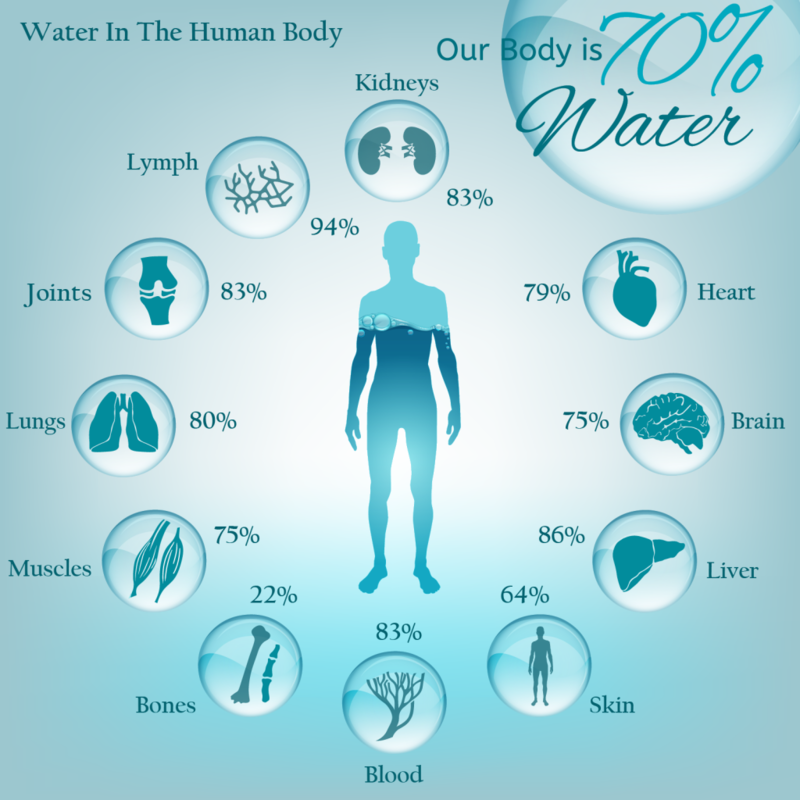 The water in our body apparently acts as a strong solvent conveying many invisible ingredients, such as minerals, oxygen, nutrients, waste products, pollutants, etc. As a result, the pH level of that water probably plays a very important role and, albeit in combination with other factors, our health could well depend on that. These other factors include the strength of the body’s biomagnetic field and electric current, the quality of the food, air and water consumed, the level of stress, etc., etc. For example, a body exposed to electromagnetic frequencies from the mobile phone grid will experience a reduction in the blood’s natural capacity to deal with the additional positive charge that those frequencies impose on the biomagnetic field, the result is that the blood cells are inclined to merge as they lose their repulsion function. Fortunately, our scientific understanding allows us to view this highly complex association forming the unity of life from a number of angles. The downside is that those angles often become exclusive of the others and instead of regarding the whole, we are in danger of analysing and separating aspects only, which although important, are barriers to a thorough perception of the actual state of affairs. In precisely the same manner that change occurs in the phenomenal world, every living cell in our body undergoes change and we are only aware of that change when it takes a turn for the worst! Life flows, just like water and anything that flows follows a movement. Movement and the patterns that the essential components of our life follow do not get much press and even less space in the laboratory. We take endless photos and marvel at the scenes laid before our wondering eyes, but we rarely ask “how come this pattern, rather than another?” Movement follows a pattern and the most common one of those in Nature is the spiral. It is in the Chandogya Upanisad that it is said “Water is prana (life-force or vital energy)”. Regrettably, not much more is explained! Having said that, there have been some remarkable characters who have spent time observing water and her ways, and anyone reading these pages will know of Viktor Schauberger and the immense contribution he made to our understanding. In its natural, self-cooling, spiralling, convoluting motion, water is able to maintain its vital inner energies, health and purity. Thanks to this natural movement of spiralling it acts as the conveyor of all the necessary minerals, trace elements and other subtle energies to the surrounding environment. This unexplored notion of the movement of the magnetic force in the body is further developed in the Biomagnetism paper. There is every advantage to be had by encouraging this motion. Naturally flowing water seeks to flow in darkness or in the diffused light of the forest, thus avoiding the damaging direct light of the sun, in all probability because of the heating or the frequential effect of the electromagnetic radiation. Under these conditions, even when cascading down in torrents, a stream will only rarely overflow its banks. Due to a correct natural motion, the faster it flows, the greater its carrying capacity and scouring ability and the more it deepens its bed. This is probably due to the formation of in-winding, longitudinal, clockwise – anti-clockwise alternating spiral vortices down the central axis of the current, which constantly cool and re-cool the water, maintaining it at a healthy temperature and leading to a faster, more laminar, spiral flow. This movement is an expression of water’s life energy, a demonstration of its vivacity synonymous with life showing us how it maintains if we care to observe. It is even perhaps an example we can copy for when water follows such movement in a stream or river, it becomes specifically heavier and sinks down along the walls towards the bottom, at the same time forcing the water there to rise up to the centre of the flow so pushing it out towards the outer walls. Continual repetition of this process results in a constant circulation and cooling of the contents. Copying these spiralling principles my various bio-patterns work on dynamising water in just a few hours! This is why it is useful to store water in a container with a round or egg shape, preferably a closed vessel. If the container is made of terracotta, it allows porosity and the external evaporation helps cool the outer walls and the water in the immediate vicinity. Every cell in the body creates waste as part of the natural function of the body’s metabolism. With regard to nutrients – whether of good or bad quality, one might say that food is either good or bad for you depending on the amount and quality of the wastes produced: toxic, acid, alkaline, etc. These metabolic waste products must be removed from our body if we are to avoid excess acidity. Problems, especially acidity, can occur if we do not get rid of these waste products. The reasons for this are generally to be found, and modified if needed, in our life style and choices of nutrition. A quick look at the generally applied standard, hydrogen potential, pH, might help. From the scientific stance it could be said that acid water has more positively charged hydrogen ions than negatively charged hydroxyl ions. For example, the number of hydrogen ions in acid water, with a pH value of 4, is 10-4 times N (the number of ions), and that of a hydroxyl ion is 10-10 times N. The natural law governing all this is such that the exponents all add up to 14 (4+10), the maximum on the pH scale. The number of hydrogen ions in alkaline water with a pH value of 9 is 10-9 times N, and that of the hydroxyl ion is 10-5 times N. Remember that 10-5 is larger than 10-9 by 10,000 times and, once more, 5+9 is 14. Because the exponents have to add up to 14, a pH value of 7 is considered neutral. Alkaline neutralizes acid, in the laboratory at least, but not so in the stomach. This is not so well understood by people in general but one more example of Nature’s function being impossible to reproduce on the laboratory workbench. One more example of how little we really understand despite our scientific arrogance and pretence in the belief that we humans control things. There is great controversy about drinking alkaline water, and one can read so much ink from the many health advisors on the web today advocating this but not the other. In theory, alkaline water helps our body dissolve acid waste, making it easier for the body to dispose of them, but would it not be logical that is the case only if that water is alive or of sufficient quality. If, as science would have us believe the accumulation of acid waste causes ageing, there is a chance that reducing acid will help reverse ageing, let alone acid reflux and many of the common ills that we moderns suffer from. Although alkaline water can not cure any disease, there seems to be a good chance if consumed regularly, it will gradually reduce accumulated acid waste and help restore the normal operation of many organic and glandular functions. But it is not just a matter of alkalinity, that would be too simplistic, the active energetic component must also be part of the equation, and that is where geometric form plays a vital role. Once more and as I never tire of repeating, check if it is good for you. Nothing could be more simple and logical (see the Radiesthesia paper) if you would like to learn more on the various methods to do this. Why believe what others tell you? What on earth do they know about your metabolism? How can anyone sincerely state that something is good for you? It is ONLY good for their wallet should you be gullible enough to believe them Such behaviour is dangerous and should be condemned, but that is now the way of the world and our resistance is declining by the day. We all have our individual makeup, it can change by the minute as a function of environmental, digestive and all sorts of other known and unknown factors, how can we possibly believe that some “expert” knows what is right for me? The more negative ions you can be around, absorb, develop in your system, the better. By making your water more alive or dynamised you can, in all probability, reduce the acid content of blood, thereby enhancing your immune system and metabolism by neutralizing the acidity caused by pollutants, yeast, etc., and so speed up oxidation and healing. In Nature, a most crucial factor affecting the health and energy of water is temperature, obviously there are other factors (some of which cannot be defined quantitatively), such as turbidity (opaqueness), impurity, and quality which are important but there is not enough space here to deal with them all in detail as they no doubt deserve. However, as Schauberger points out, water adopts forms in its many manifestations and the applications of those forms have some surprising – for some – results. This is where we can have an influence on the quality of water, and as a consequence, on our health. As a liquid, the behaviour of water differs from all other fluids. The latter become consistently and steadily denser with cooling, water reaches its densest state at a temperature of +4°C (+39.2°F), below which it grows less dense. This is the so-called ‘anomaly point’, or the point of water’s anomalous expansion, which is decisive in this regard and has a major influence on its quality. Below this temperature it expands once more and probably returns to its original status. This highest state of density is synonymous with its highest energy content, a factor to be taken carefully into account, since energy can also be equated with life or life-force. It is quite remarkable that the lowest specific heat of this “inorganic” (for science) substance – water – lies but 0.5°C (0.9°F) above the normal +37°C (+98.6°F) blood temperature of human beings. This property of water to resist rapid thermal change enables us, with blood composed of 80% water, to survive under large variations of temperature. Since a dynamised water has more hydroxyl OH– molecules than hydrogen H+ molecules, there are more oxygen atoms in such an alive water than in neutral water. That is why dynamically enhanced water is sometimes called oxygen rich water. In the same way, acid water is oxygen deficient. It is the huge amount of hydroxyl ions that seems to neutralize acid hydrogen ions in our body so reducing the accumulated acid wastes. Looking at the situation from a chemist’s standpoint, we know that the stomach is a highly acidic environment, with a pH of around 4, it would be a natural next step to ask what happens to the dynamised water when it hits this bed of acid. Apparently even more hydrochloric acid is produced when the water gets there, in order to maintain the acidity at a pH level of 4, and the stomach will continue generating more hydrochloric acid as the water arrives! This acid is produced on a just-in-time basis from the naturally occurring carbon dioxide, water and sodium or potassium chloride. The resulting sodium or potassium bicarbonate then acts as an alkaline buffer neutralizing acid in the blood stream. Now for more real elements, in that we can observe the movement rather than the theory. This is a diagram from one of Viktor Schauberger’s notebooks, explaining the movement followed by water in a spherical container. It recalls John Keely’s toroidal form in his portrayal of an atom. It would appear that in an enclosed space – and perhaps elsewhere, the spiral becomes a continuum, generating and releasing energy on its path, subject to influences which are rarely apparent to our sense of observation, but manifest due to peripheral phenomena. My research of recent years has shown me that the simplest of form-movements, namely spiraling clockwise – even with your hand – over water, food or other, can have very beneficial results on the energetic content. In much the same way that stirring your tea or coffee anti-clockwise can give you a stomach ache, turning the spoon clockwise has the reverse effect. Obviously, such action must be accompanied by a thought-intention. If you keep your water in an egg-shape container, then you can more easily encourage the spiral vortex form to develop, so energizing the water. It is the energetic factor, the life component which seems to be of the essence. The material obviously has an influence on the whole process, glass but not translucent, earthenware or noble metals would seem to have the preference of choice. Plastics and metals are not recommended because any energetic movement inside is going to “erode” the particles over time. External influences are of course to be considered but even the most efficient of experimenters will be unable to contend with atmospheric pressure, solar flares and the like, so be like water, stick to the low ground and keep on with the spiralling, by hand, pattern or intention. One of the qualities of water, especially bodies of water, is to generate negative ions (anions). This is due to the evaporation of water, and the atmosphere gains one or more extra negatively charged electron in the process. The benefits to our environment from negative ions is substantial. They are to be found everywhere, in the air that we breathe and in our bodies. When in sufficient quantity, these particles have an influence on free radicals (anions can neutralize them), cell metabolism and the immune function, the blood and the autonomic nervous system (influencing sleep and digestion). Once again we enter the field of science with its remarkable revelations, but let’s keep it simple. Most importantly, as I understand it, the negative ions can offset electromagnetic fields. As is generally the case, if we take care of our health and well being by caring for the whole, rather than the individual aspect, we can do a lot to improve our lot. There are numerous ways to influence the negative ions. It is always mildly amusing to read of our recent knowledge, inventions and discoveries. As if we moderns are the only ones to have grasped the secrets of Nature and our unfortunate predecessors suffered in ignorance and worse. This is probably human nature at work, but is not a very flattering picture of “science” with its formal, formulated doctrines requiring repetition without which nothing can be officially proved. Any feeling person understands that air, like water, is a living substance. Their qualities and properties changing with climate, location and individual metabolism. While it may be useful to have scientific input to “explain” how it works, it would be more practical to know how it fits in with the whole. There can be no such thing as good or bad, there can only be good for one and bad for the other. Death is merely as stage of disintegration and life, one of growth. The negative and positive, cation and anion. Like death, the cation is not good to be around. Shopping malls where static, caused by a high ratio of positive to negative ions mainly due to a lack of moisture in the air, complicated by the electronic gadgetry, wifi, noise and building materials, are the epitome of poor energy places – yet food and drink are stored and sold there, we even eat and hang out there! Reputedly, one of the more sensitive components of atoms is the electron. They come and go subject to everyday events. Thunderstorms, forest fires, sunspot activity all play their part in working their effects, combined and individually, on the change to the delicate balance of electric charge. The balance of negative and positive ions in the environment is easily upset and very probably the cause of many modern ills, affecting the human metabolism so strongly as they do via the air, water and the intense misuse of electromagnetic fields. It is easy to blame pollution, but we are at the origin of this pollution and are forever wanting more, so there is little point in pointing fingers in blame when we are at the source of the problem. Offices, industrial and commercial areas are the main providers of positive ions, forests, waterfalls and the seaside are the suppliers of negative ions. The effect of these on the human body should not be differentiated as it merely increases the sensational impact of the claim, e.g. negative ions increase this and boost the other, whereas positive ions constrict that and weaken the next. We are remarkably resilient as a species, even if we are getting weaker judging by statistics for the consumption of medication and the incident rate of fatal conditions. The fact remains, however, that it is a good idea to reduce serotonin levels by any means available. One of the possible consequences of high levels of positive ions in the body is an increase in the stress hormone, serotonin; this causes all sorts of disturbances and the theory is that there is a relationship between the two. Of all the essentials required by humans on a regular basis here on earth, water must be one of the most neglected. If the quality of the air deteriorates, we still generally manage to extract sufficient gases to maintain, although Fukushima may put a lid on that with its generous cocktail of isotopes, but Nature works in weird ways, so we are not there – yet! We obtain an average 40% of our energetic needs from food, the remaining 60% being provided by air and water. The way we are currently producing food industrially appears to be very questionable to say the least as regards nutritional value and ultimate health – for all concerned. But water? How many people drink the recommended three litres of water a day? Let alone of sufficient quality to provide our cells with the necessary sustenance? Even when it is deadened by chemicals, or subjected to violent treatment as in purification and bottling plants, it can still be brought back to life and seems to want nothing more than to radiate life. Most of us have seen the photos of Masaru Emoto and come away with a vague notion of why you should be “nice” to water. It is not in our educational paradigm to talk to “inanimate” objects, although most of us have no objection to doing that so long as we are not ridiculed. How many people realize that just by spiralling your hand clockwise over a glass of water you can achieve exactly the same results as by playing pleasing music to it or saying nice things? This aliveness of water and everything else around us is a reality and we are very much a part of it. Even more surprising perhaps than the spiralling over water is the capacity that a geometric form can have on the characteristics of water. I believe it is the inherent vital force in water which acts on the form or shape if you prefer. In the last fifteen years I have been experimenting extensively with geometric form and water and am now so convinced of the effects which can not only be tasted but even measured, that I offer the Vitalizer to demonstrate the surprising result. It is not what some clever human has done to the water, it is simply a matter of the water reacting due to its being alive. Human intervention is still necessary, fortunately, we are not to be disposed of so rapidly! Having said that, our action is limited to choosing a suitable form and material for the water container and the period of time it stays there. It is best to put the water in an open-necked container and leave it for a minimum of 2 hours, with no apparent limit. I just keep topping up the earthenware pot at home. When I first started experimenting with these forms and water, a soap-maker friend in Bangkok was delighted to find that forty eight hours on the Spiralizer and the pH of the water has reached 13, which is far too much for a human but good for making soap! Obviously, there are quite a few parameters involved, e.g. the original pH, the quality of the water, the form of the container, transparency, etc. It would be neither respectful nor just when speaking of water research if no mention was made to the brilliant work and explanations of Viktor Schauberger, to whom humanity has an immense debt – even if we ignore what he has bequeathed us! As a keen observer of nature he believed that life is movement and as such, epitomised by water. Water, he said, is in a constant state of motion and transformation, with effect both externally and internally. If confirmation for this fact is needed, one only has to consider the potential of water, it can combine with more substances than any other molecule. Flowing as it does in our planet as water, sap and blood, it is the creator of so many life-forms. Not only did Schauberger believe that water is the fundamental basis of all life, but that it is a living entity and should be treated as such. Failure to do so, he said, quickly transforms it into an enemy, rather than the nurturer and furtherer of all life that it should be. One only has to consider the effects of drinking distilled water, albeit devoid of any so-called “impurities”, it rapidly leaches out minerals and trace elements, debilitating and ultimately killing us. The chemical formula of H2O is a surprising way to explain succinctly something which we cannot live without. Has our understanding of water been reduced to that? We manage to transform something vital into a word into a notion, scarcely an idea, which is so far from the truth that we even tend to disdain the substance. 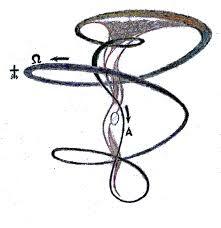 The spiral, vortical motion mentioned earlier, which incidentally led Viktor Schauberger to the formation of his theories concerning ‘implosion’, creates the conditions, where the germination of harmful bacteria is inhibited and the water remains disease-free. His books can be found on the net and are well worth investigating for anyone interested in the subject. A word of warning, if I may, at the risk of temporarily paralyzing your spleen, avoid ice. Ice, like MSG (monosodium glutamate) stops the spleen from its all-important functions of digestion, assimilation and distribution. When one knows the role played by the spleen in storing intention and governing thinking, one better understands why the Chinese don’t use ice! So much to discover, but please remember one simple home truth, the body needs water to function well, some say 3 litres of water a day. Preferably living, energized water, neither tea, beer, coffee nor soft drinks do the trick.